Luminous prose! 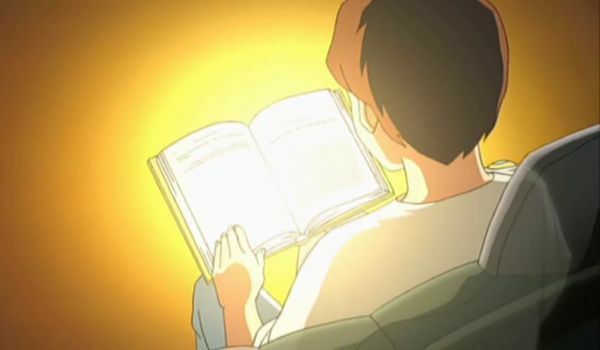 In the movie The Golden Laws (by Ryuho Okawa) a boy in the future finds the book The Golden Laws (a real book by Ryuho Okawa), and a great adventure begins. It would be easy to mock, except his books are actually great examples of luminous prose. Your luminosity may vary. This morning I read an online friend complain that the word “luminous” was too much used about books recently. But I really love that word. I wish it could be said about my words, and that it would be true. The book in today’s picture is one of the first published by Ryuho Okawa at the time he founded Happy Science. In my humble opinion, he has grown more luminous in some of his later books. But in general, his writings really come across as light-filled. And they are easy to read too. That is what I want to do to others. But it is not easy. I admit that the English language has seduced me with its riches. There are so many words, so many ways of saying things, so many styles, so many nuances. I tend to use words that my fellow foreigners don’t know, and I tend to use long and complicated sentences. All of this is mostly for the joy of the phrase, not because I love the reader and want him or her to understand as deeply as possible. There are some people who are very concise, but are hard to understand. This seems to be common among serious spiritual writers. Frithjof Schuon and Sri Aurobindo both have books that I start on repeatedly but give up. They are just too dense (not the writers, but the language). Old or rare words, even by my standards, may be extremely precise. But I may not understand them deeply enough to appreciate all the knowledge packed in them. When I do “get it”, it is a great joy. But at the same time there is a lot that I don’t understand, or at least not the way it should be understood. This entry was posted in meta, writing by itlandm. Bookmark the permalink.